If you are living with the effects of hidradenitis suppurativa, you may feel helpless in alleviating the symptoms. At the Atlanta Center for Breast and Aesthetic Surgery, Dr. Frederick T. Work, Jr., is experienced in reconstructive surgery for this painful condition. Our Hidradenitis Suppurativa Before and After Pictures feature some of our patients in Buckhead, Vinings, and Sandy Springs. 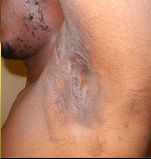 Hidradenitis suppurativa is a dermatological condition that involves bumps under the skin near the sweat glands. The incurable condition results in an extreme amount of discomfort. The symptoms can be controlled to some degree, but men and women with hidradenitis suppurativa consistently feel a degree of pain in the affected area. 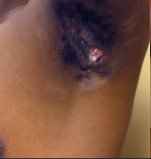 Treatment of hidradenitis suppurativa depends on the severity of the condition. Dr. Work uses a progressive plan to find the treatment that is right for you. He may prescribe medications to control inflammation and infection. If these approaches do not work for you, he may recommend surgery to the skin. Our Hidradenitis Suppurativa Before and After Pictures show you how effective his approach to treatment is for his patients. You no longer have to live with the pain and embarrassment of hidradenitis suppurativa. Our patients have entrusted their care to Dr. Frederick T. Work, Jr., and our Hidradenitis Suppurativa Before and After Pictures show you the results of treatment at the Atlanta Center for Breast and Aesthetic Surgery. Contact us today to schedule a personal consultation.